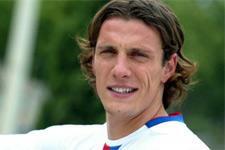 Today, 11 August 2006, Sébastien Squillaci celebrates his 26th birthday. A new arrival on the banks of the Rhône this year, "Toto" has distinguished himself since his debut in the Olympian strip, with performances of the highest order. Defensively and offensively, his play in the air impresses, giving him a first goal in his new colours against Nantes. Indomitable in defence, the ex-Monaco player has confirmed himself as one of the very best players in the championship in his position. For his birthday, let's wish him an ever-rising tally to add to his already very good 10 goals in Ligue 1 out of 118. Olympique Lyonnais wishes Sébastien Squillaci a very happy birthday.